Cook By Numbers - I'm The Chef Too! Calling all math lovers! Join our kitchen and become a master chef of mathematics. 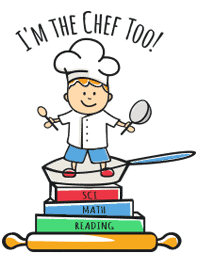 Children will explore a variety of mathematical topics while applying their skills in the kitchen! Prepare, cook, and snack your way through each concept while learning new recipes. Chefs will problem solve and use critical thinking in order to cook up mathematical creations. Learning new math skills has never been tastier!